You need advice. We know Trade Show Displays. Banner Graphics can be used on their own or with additional hardware. The cheapest option is to simply hang a banner, which requires no additional hardware. The downside of this is that you need something to hang the banner from, which in a trade show setting is often an issue. That’s why Banner Stands exist. 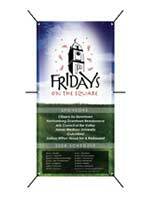 Banner Stand hardware is intended to provide the simplest way to display a freestanding banner graphic. Retractable Banner Stands make transport and set-up a breeze using a spring loaded graphic that retracts into the base hardware. For a different look, check out Tension Pole or X-Stand Banner Stands.